agency/ landlord gave you the date of when you move in and now What???!! This is Part 2. Moving to rented apartment! Jump link to Part 1. Before you rent tips and hints. the boxes to be covered. Opt for strong boxes as well. the staff you don’t need. Pack few things everyday like old books or clothes. Worst you can do is leaving everything until last day! Buy black marker and once each box is closed, write whats inside like books, photographs etc. It will be easier to find it later. know where to put staff straight away rather just randomly damping boxes. once lost so much of deposit for being such a naïve and trustworthy person! There were several imperfections, wholes already, and I didn’t check properly. so it will have the date on it. so its worthy in case of accidental damage! have all that information’s! Do you have parking spot for the driver? On moving day it can be very stressful. I would advise to swap to coffee for a chamomile tea and do some stretching in the morning! It will relax you and prepare you for the day. Give a call to the driver and make sure he knows the current and new address so he wont be driving around trying to find where to park or fighting with GPS. of your new keys set! I've recently moved into my first rented property from my family home and thankfully I had already done all of this, I had friends and family for help and support. they informed me of things like the inventory check and meter readings and I'm so glad they did because there we more than a handful of things that were missed off the inventory! The inventory list is invaluable. 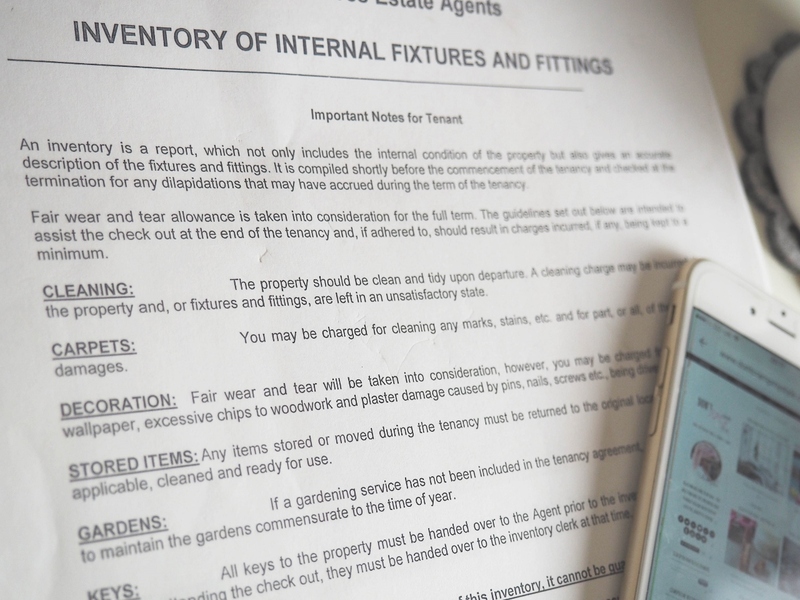 There are far too many unscrupulous landlords in the private rental sector that will do anything to avoid returning a deposit. We have just moved and we had an overlap so we had a couple of weeks to check the new place, move and then properly clean and check the old place. It really helped reduce the stress of moving with a toddler. This is all great advice!! Thankfully I never had to find my own accommodation whilst at uni and have been quite lucky on my year abroad but the tips for moving stuff around in general are very useful! Awesome tips! My last move was so insanely stressful and the company that moved us were terrible, broke a majority of my stuff because they just flung the boxes! Next time I'm doing research and looking for reviews! I've not rented before but these sound like very sensible tips. Some great tips there, I'm moving house at the end of October although not rented but your list still reminded me of a few things I need to remember doing. I absolutely love moving house. It's like a blank canvas and a great opportunity to get rid of things you don't need. I had my agency hounded over the inventory. They had missed so many things off and I made a lot of changes too. Don't forget, if you have permission to dispose of any broken or unwanted furniture then this needs to be noted in the inventory too. We had a broken chair, ruined mattress and some lights fixtures that were bust but we had to get it in writing and co-signed on the inventory that we could dispose of these things – you don't want to be charged for throwing it away!